ExPress enables you to compress your executable files, with many customizable configurations and without affecting your computer’s performance. 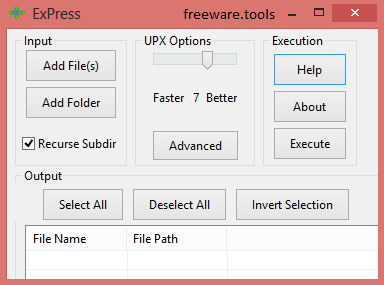 ExPress is a cross-platform GUI wrapper for UPX (Ultimate Packer for eXecutables) written in Lazarus and Free Pascal. ExPress is a portable tool, which means the installation process can be easily skipped. As a result, the Windows registry and Start menu/screen are not going to suffer any changes, and no leftover files will remain after its removal. Just execute this tool and start using it without the need to install it. ExPress is an open-source and cross-platform GUI for UPX and therefore, it is built to help individuals compress their EXE, DLL, COM and SYS files. Another important aspect you should take into account, is the fact that you can run ExPress on any computer you have access to, by simply dropping the program files to a portable storage unit. The main menu presents a scroll bar to help you choose between the fastest way to pack files and the best way of doing this. There are also some advanced options to tinker with, such as using the LZMA compression, brute or ultra brute methods or simply force it. You can choose the number of threads to work with, as well as keep backup files or not. Executables can be added to the utility with the help of the built-in file browser or the “drag and drop” function. All uploaded items are going to be displayed in the main window, as a list, along with information such as filename, path, size before and after compression, and result. No other notable options are available. CPU and memory usage is kept at a low level, even during the compression or unpacking process thus, the computer’s performance will not be tampered with. All in all, ExPress proves to be a useful piece of software for decompressing and packing executable files, with a good response time, an intuitive interface and enough options to satisfy all user categories.